Loving to cook and spending hours by a stove-top on a hot summer night do not necessarily go hand in hand. While I like to limit my time in the kitchen on a really hot night, it never comes at the cost of a wholesome and appetizing meal. The abundance of fresh seafood and superb summer produce are the perfect inspiration and ingredients for light, uncomplicated and exceptionally flavorful meals. I recently ate a scrumptious but rather unhealthy Roasted Garlic and Bacon Dip. The base of this dip was mayonnaise and hence the fat content was off the charts. My father recommended that I test making something similar with hung yogurt. 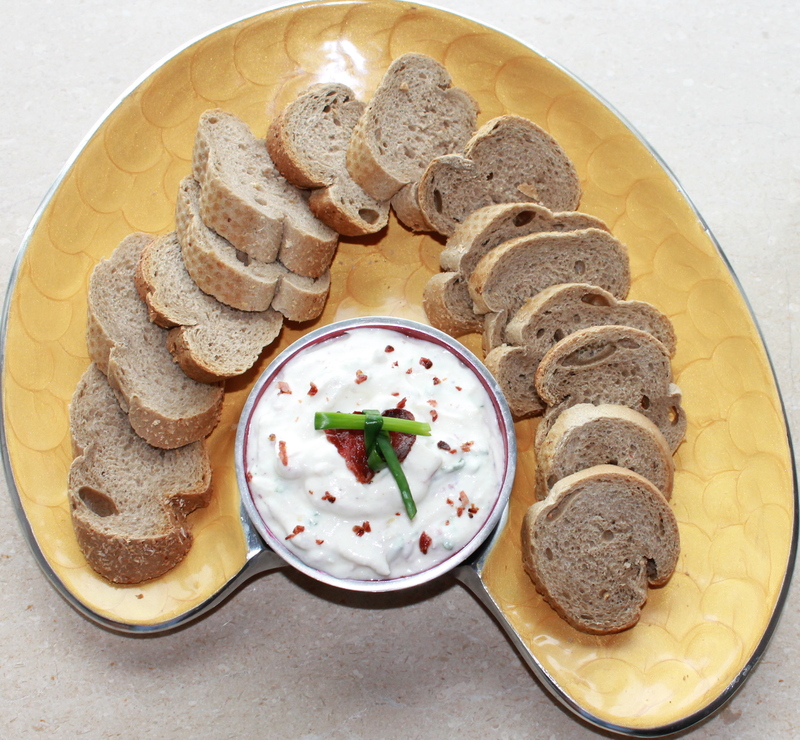 Yogurt dips are a wonderful light and figure-friendly appetizer for the warmer summer months. 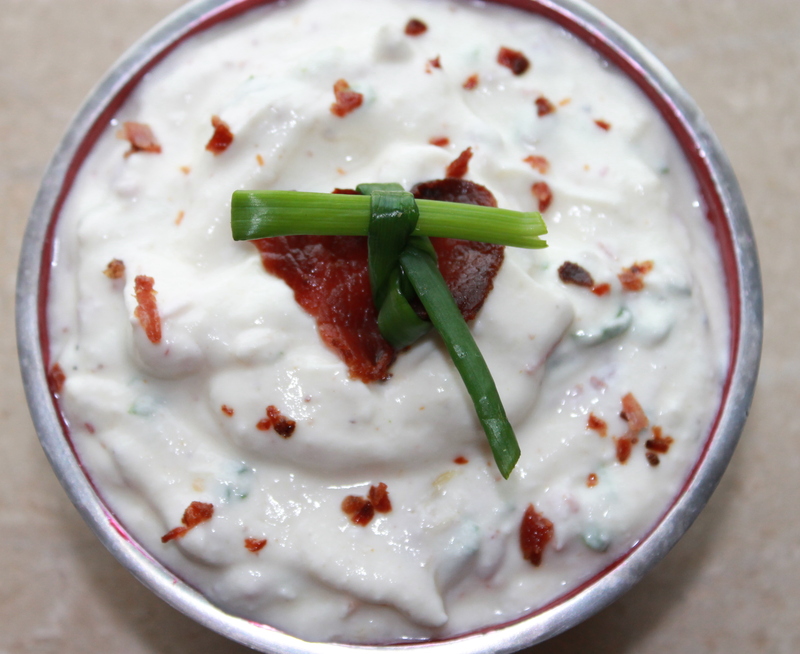 Since yogurt is so versatile there’s a multitude of yogurt dip recipes available. Despite yogurt being the common denominator you can always find a way to switch things up by playing around with the additional flavor elements. My Facebook news feed is flooded with updates of plans and preparations for the potential historical blizzard – winter storm Nemo. Since you cannot really beat Mother Nature at her game, why not stay in and warm up with an effortless, delicious and hearty one-pot soup-based meal? And even if you are not caught in the eye of this storm this is the ideal flavorful and healthful one-pot meal for any chilly night. 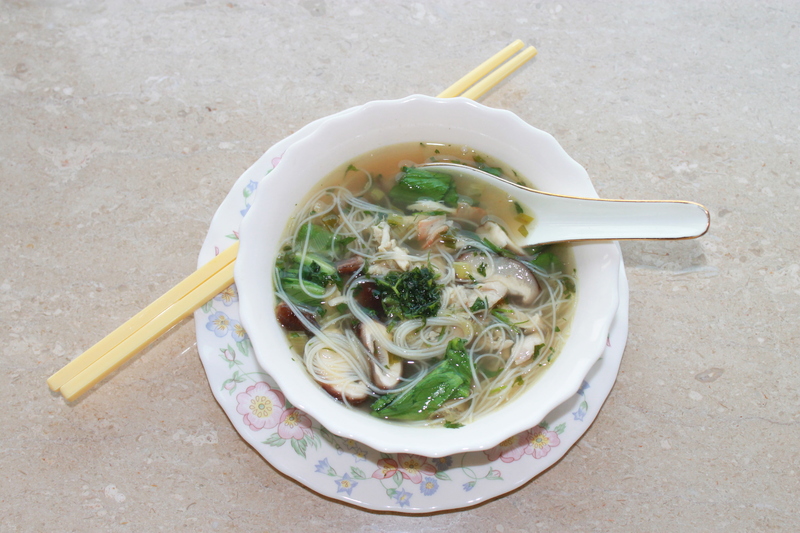 This soup is a detour from a classic chicken noodle soup; it is in fact a Far East variation of it. Ginger, lemongrass, lime and Thai birds-eye chilies breathe new life into a classic chicken broth, while the bacon adds a layer of smokiness to it. The chicken, noodles, bok choy and mushrooms come together to create a well-balanced meal. There’s nothing wrong with a traditional chicken and egg-noodle soup, but this feisty and flamboyant cousin is sure to gratify your soul on a cold and dreary day. Fresh lemongrass is available at all Asian grocery stores and several large grocery chains. If you cannot find fresh lemon grass then, substitute it with the bottled kind that can be found in the international aisles of most grocery stores. Thai basil is available at all Asian grocery stores and several large grocery chains. You can substitute the shitakes with crimini or white button mushrooms. The fish sauce and broth are salty, so make sure before you add any additional salt you taste the soup to determine how much you need. 1) Pour the chicken broth into a large stock pot. To this add the lemongrass, ginger, garlic cloves and birds eye chilies. Bring these ingredients to a boil over medium-high heat. Once the broth reaches a roaring boil, reduce the heat to low and add the chicken breast. Cover and simmer until the chicken breast is fully cooked. 2) Turn-off the heat and remove the pot from heat. Remove the chicken breast and it set aside to cool. Remove the ginger pieces and garlic cloves from the broth and discard. At this point you can even discard the lemon grass, but I prefer to remove it right at the end as it keeps infusing the soup with flavor. Set the broth aside to use in the soup. Use a fork to shred the chicken once it has cooled and is easy to work with. 3) In a medium Dutch-Oven or soup-pot, heat the olive oil on medium heat. Add the diced bacon and cook it through. Now add the scallions and sauté for 1-2 minutes. 4) Add the broth to the Dutch oven and bring to a boil (uncovered). Once it reaches a rolling boil, reduce the heat to low and add the bok choy and mushrooms. Cook for a minute and then add the shredded basil, chicken, noodles, fish sauce and salt and pepper to taste. Give everything a good stir and then turn-off the heat. 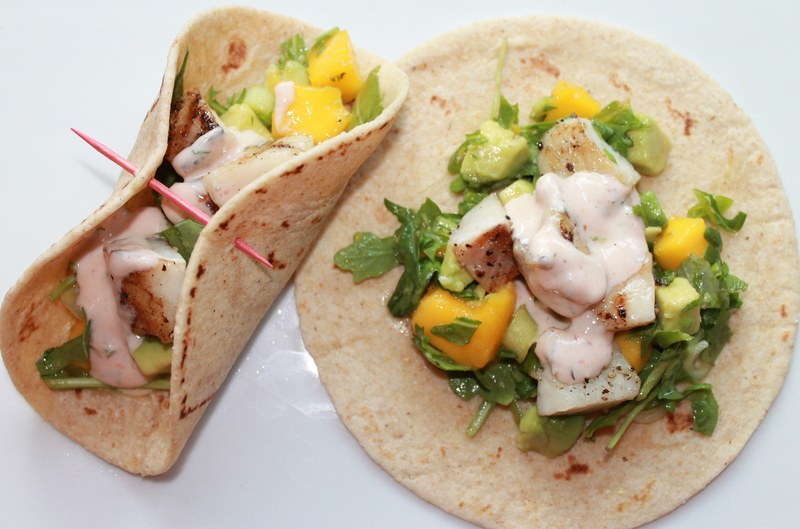 5) Stir in the lime juice and garnish with cilantro. Serve with Siracha sauce for some extra heat! Necessity is the mother of invention, and often how a new recipe is born. In fact excess of a perishable ingredient and a desire to do something special with it often inspire tasty solutions in my kitchen! Pickle # 1: I have a bunch of arugula that I need to use up soon, and I do not feel like eating a salad tonight. Duh, but I always eat Arugula in my salad! Solution #1: Make a Pesto out of it! Pickle #2: A basic Arugula Pesto is a bit too strong by itself on bread. Solution #2: It could use some sweetness and tang and possibly the addition of neutral and creamy component. Hmmm…how about topping it with SUN-DRIED TOMATOES & GOAT CHEESE? Final Result: Aha! The perfect balance of flavors on a slice of crusty bread. It’s a party in your mouth when the sweet, acidic and chewy sun-dried tomatoes balance out the sharp taste of the pesto and the creamy texture of the goat cheese. Pair this with a crisp Sauvignon Blanc and its a lot more elating that a classic Arugula salad! Pine nuts can be toasted in a non-stick skillet on low heat. Keep an eye on these as they get done quickly and can burn easily. They are ready when they have a light color change and you can smell them. French Baguettes are typically a lot harder than Italian Baguettes. Since I used a French Baguette, I did not toast it up for the Crostini. If you use an Italian Baguette or another softer baguette, you should toast it in the oven or under the broiler to ensure crusty bread that stands up to the toppings without getting soggy too soon. 1) In a food processor or blender combine the arugula, garlic, roasted pine nuts, Parmesan cheese, peppercorns, olive oil, crushed red pepper and salt to taste. Blend this to a thick paste, or leave some texture if you prefer a chunkier pesto. 2) Slice the baguette into 1 inch slices on a bias. 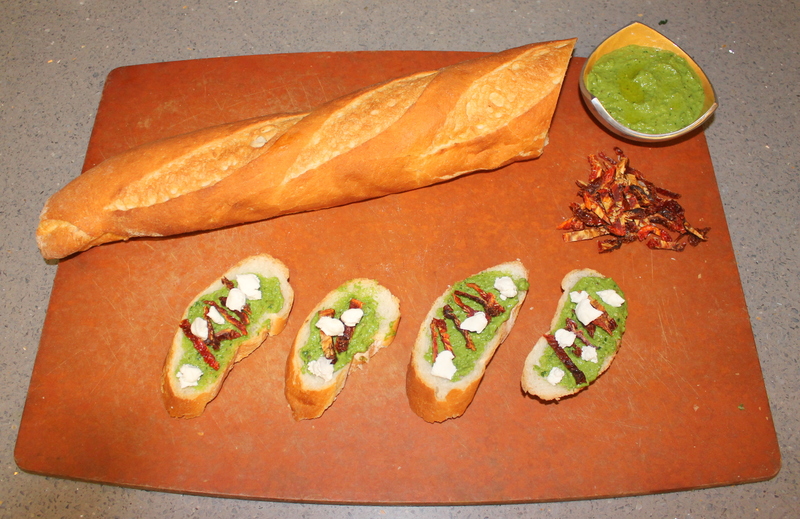 3) Spread a layer or two of pesto on each slice. Now top each slice with a few sun-dried tomatoes followed by goat cheese crumbles. I was skimpy with the goat cheese, to reduce some of the fat content, but these are even tastier when you are generous with the sun-dried tomatoes and goat cheese! I revealed my love for Indian breakfasts when I shared my Chai Chocolate Truffles Recipe a few weeks earlier. I have always loved a good Upma for breakfast. 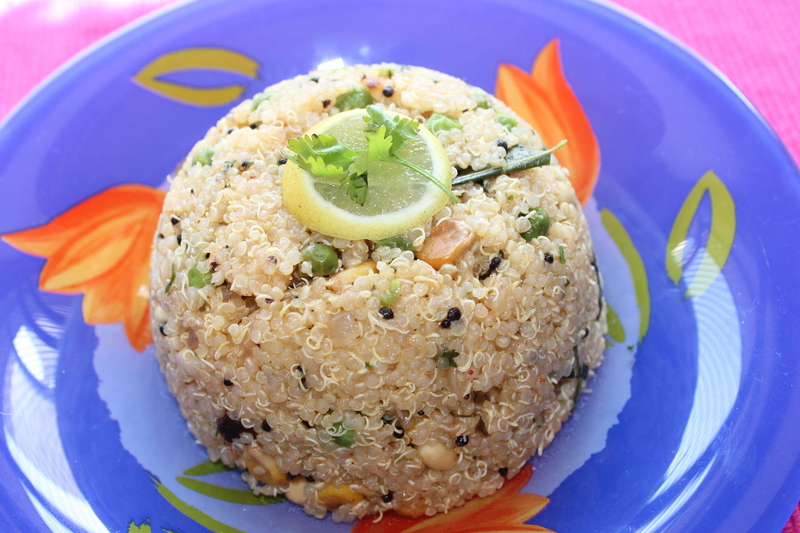 Upma, is a common South Indian savory breakfast dish made with dry-roasted semolina. Vegetables and spices are added in the cooking process to create a wholesome and delicious breakfast item. Since I am still repenting for my gluttony in the last few months of 2012, I wanted to recreate my favorite upma with a lower carbohydrate and higher protein substitute for semolina. The ingredient is (yes, yet again!) 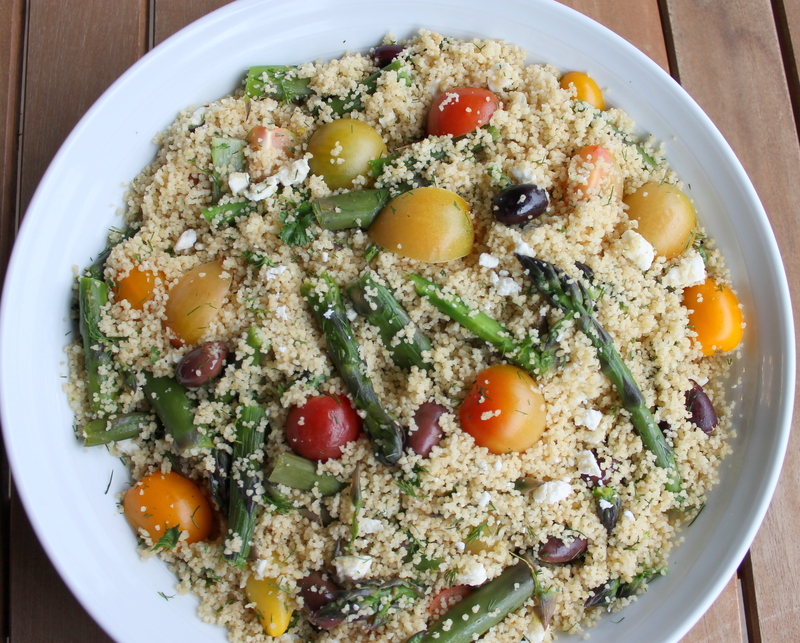 the super food – Quinoa! Quinoa, turned out to be a perfect textural substitute and a wonderful blank canvas to be enriched by the tempering of mustard seeds and curry leaves in a little ghee (clarified butter). I only included peas and corn for the vegetable additions to this upma, but you can substitute or supplement them with cauliflower, green beans and even cabbage. This upma is sure to satisfy your palate without undoing your ongoing New Year’s resolution of eating healthy. Ghee is clarified butter and is commonly used for cooking in the Indian Subcontinent. It is widely available in all Indian, Pakistani and Bangladeshi stores. If you cannot find ghee – just substitute it with 1½ teaspoons of unsalted butter. 1) In a medium pot cook 1 cup of Quinoa along with 2 cups of water, as per the package instructions. When cooked, fluff with a fork and set aside. 2) In another medium non-stick pot heat the oil and ghee on medium heat. Once the oil is heated add the mustard seeds. When the mustard seeds start to sputter, add the curry leaves and cook them for 1 minute. 3) Now add the onions and green chilies and sauté until the onions start to change color. Add the ginger paste and cook for 1-2 minutes. 4) Add the peas and corn along with 1-2 tablespoons of water and cover and cook till the peas and corn are tender. 5) Add ½ teaspoon red chili powder and salt to taste. 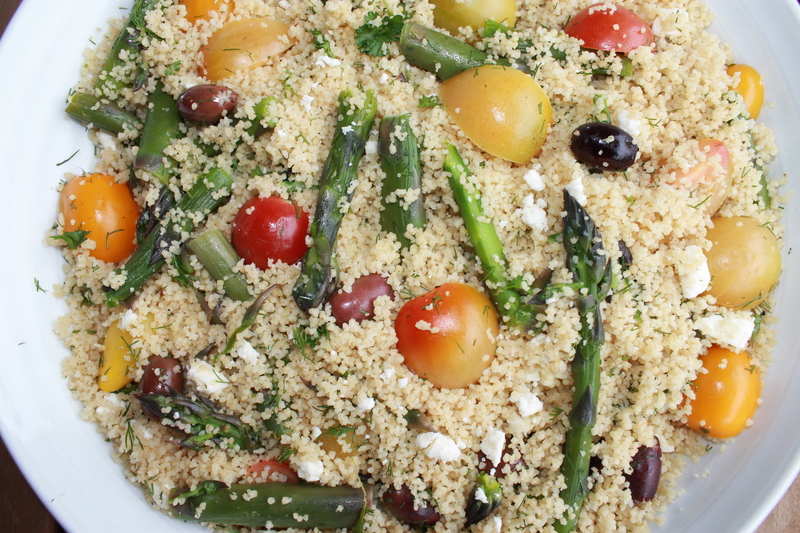 Now add the quinoa and toss gently to mix all the ingredients into the quinoa. 6) Turn off the heat and remove from the stove-top. Add the cilantro and give the quinoa another quick toss. 7) Season with lemon juice to taste and garnish with crushed peanuts. (Add more salt if you need to at this stage).This can be served by itself or with an accompaniment of store-bought mint or cilantro chutney.